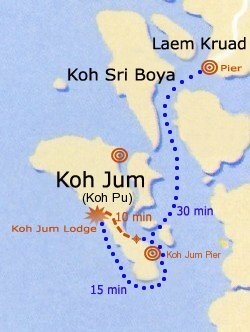 Koh Jum Lodge is located on Koh Jum or Koh Pu Island, Krabi Province, Southern Thailand. The 12 kms long Island is situated in the Andaman Sea in the area referred as Andaman Triangle or Turquoise Triangle, facing Phi Phi Island to the West, Koh Lanta to the South and Krabi to the North. 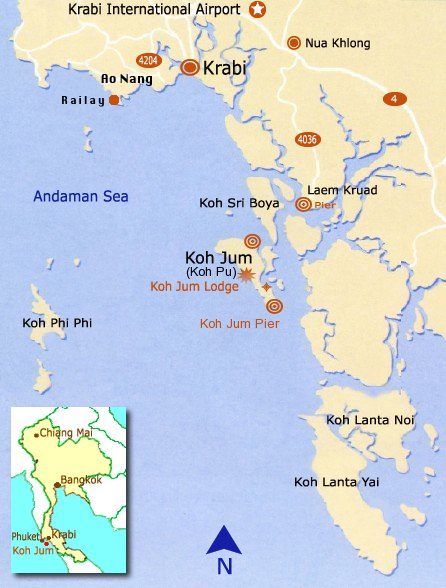 Koh Jum Island as a whole is unspoiled and sparsely populated. There are just three small fishing villages with a total population of around one thousand five hundreds inhabitants. The Koh Jum Lodge is located on the 4 kilometers long beach stretch of untouched sandy beach, fringed by an endless line of coconut trees and casuarinas. The facilities on the island remain basic: there has not been any large-scale tourism development. This lack of tourism on a commercial scale is a key attraction on Koh Jum Island. After 35 minutes by minibus, from the Krabi airport, our long tail boat will take you from the pier of Laem Kruad to Koh Jum Island in about 45 minutes. To reach Krabi, the best is to fly from Bangkok with Thai Airways, Bangkok Airways, or Air Asia (1h20 flight); or from Kuala Lumpur, or from Singapore with Tiger Airways. Remark: Long tail boat transfer cannot be operated after 17.30. Capitalizing on the excellent and preserved marine environment, the Koh Jum Lodge will organize snorkeling tours to Phi Phi Lay, Phi Phi Don, Bamboo, Mosquito island; or Railay; Koh Poda, Koh Kai, with the local boatmen or fishermen of Koh Jum. During high season, a few local travel agencies rent sea or mangrove swamp kayaks, motorcycles; and organize treks to the mountain of Koh Pu and fishing trips. Mattress, bed sheets, pillows and individual mosquito net. Child (4-12): 500 THB/day including breakfast. Child (12+): 1,000 THB/day including breakfast. Adult (Triple): 1,000 THB/day including breakfast. Conditions of reservation: payment of 25% after confirmed reservation, or minimum 4 nights, balance payment 30 days before your arrival to the Lodge. The cost of cancellation is calculated on the total price of your reservation. Any reduction, change of dates for stay, is considered as a cancellation. All prices are per single or double/twin room including daily breakfast, government taxes (VAT). Peak season “A” period: Minimum stay of 7 consecutive nights is required. Peak season “B” period: Minimum stay of 5 consecutive nights is required. High season period: Minimum stay of 3 consecutive nights is required. The Koh Jum Lodge can welcome families, with children from 4 years old. Maximum of 2 children per cottage. Supplement for child: (mattress, bed sheets, pillows and individual mosquito net.) 500 THB/day including breakfast for a child under 12 years & 1,000 THB/day for over 12 years, or adults. Private transfer rates by minibus (35 mins) and long-tail boat (45 mins).